PaintSupreme 3D has all the traditional tools you love from other digital painting and image editing packages, like a magic wand tool, powerful selections and high-quality brushes. But PaintSupreme 3D adds its own flavor to the mix. Your tools can not only apply color, but also optionally materials and bumps. This gives the images you create 3D attributes which are rendered in realtime, on your GPU, utilizing lights and shadows, resulting in stunning and unique images. Take the attached screenshot of the "Stone Giant" for example. It has been painted with reflective materials, bumps and has been lit using two light sources. You can freely move the light sources to see how this changes the mood, lighting and shadows of the scene. Materials and lights in PaintSupreme 3D use state-of-the-art technology like PBR and GGX. Layers are arranged on a timeline. This means everything in your project can be automatically key-framed and animated, like layers, lights and even effects and filters. You can animate content in a layer via the transform tool or by simply changing the layer properties. You can change the in / out times of layers and effects like in a video editing product. 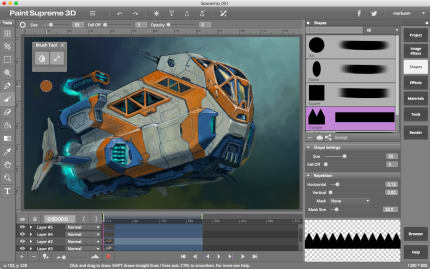 Export your animated projects to GIF-Anim or image sequences. PaintSupreme 3D uses mathematical brushes. Shapes are based on mathematical primitives which can be edited and repeated. Mathematics ensure that your brush stroke is always of the best possible quality. Apply filters directly to your layers or arrange them on the timeline for animation purposes. PaintSupreme includes several high quality filters, like the Circle Dithering Filter highlighted in the screenshot. 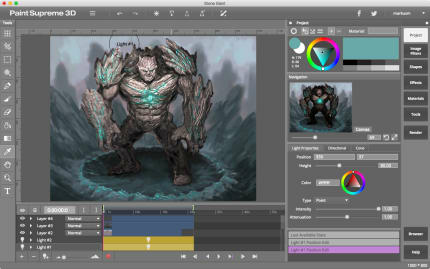 A special paint mode gives you a lightweight user interface optimized for full screen drawing. TOOLS • Transform tool. Transforms selection or layer. Supports key-framing for animation. • Crop tool. • Selection tool with rectangular, elliptical, free-hand and polygonal modes. Supports opacity and cropping. • Magical wand tool. Supports sensitivity and de-noising. • Pen and brush tools with shape, materials and bump support. • Eraser tool with materials and bump support. • Bucket tool with materials and bump support. • Gradient tool with linear, radial, angle and diamond modes. Supports materials and bumps. • Color picker tool with material and bump support. • Hand tool. • Zoom tool. • Text tool. MATERIALS AND BUMPS • Optionally apply color, material and bumps when using your tools. • Choose if you want to add or remove depth (bumps). • Manually adjust your materials or use one of the inbuilt materials. 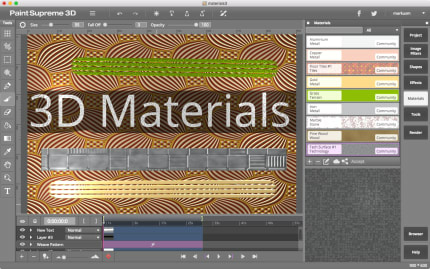 • Create sophisticated new materials using the material editor and share them with the community. 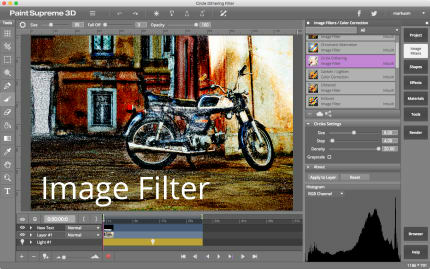 IMAGE FILTERS AND EFFECTS • Apply directly to a layer or add as a timeline object. • Render in realtime on the GPU. • Animate effect and filter settings on the timeline.